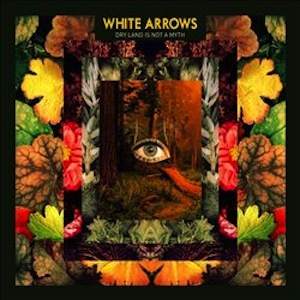 White Arrows is a five-piece psychadelic rock band that tries very hard to incorporate all its influences into a finely tuned piece of music. On their debut album Dry Land Is Not A Myth, the band explores different Afro-influenced beats and rhythms while throwing in their own indie rock styling, which makes for an interesting sound. Opening track “Roll Forever” is the perfect example of what this band stands for musically, not really being able to pinpoint the direction of the song. Then they have songs like “Coming Or Going” that possesses a catchy electro dance groove that is sure to have any listener dancing in a heart beat. The band never settles for one sound throughout the 10 tracks and all five musicians show a great deal of talent noted by the unique sounds that can be heard in each song. The album gives off a sense of free spirited carelessness that is not heard very often. Newer bands tend to play it safe and play music that sounds recycled, but not White Arrows. It might be due to the remarkable story of singer Mickey Church who was born blind and later had his vision corrected at the age of 11. He recalls memories of being lost in his imagination as a child, taking his mind where it wanted to go. The band follows that same mindset on their debut album, and ends up with a record full of songs that were meant to be mind boggling and yet feel familiar at the same time.